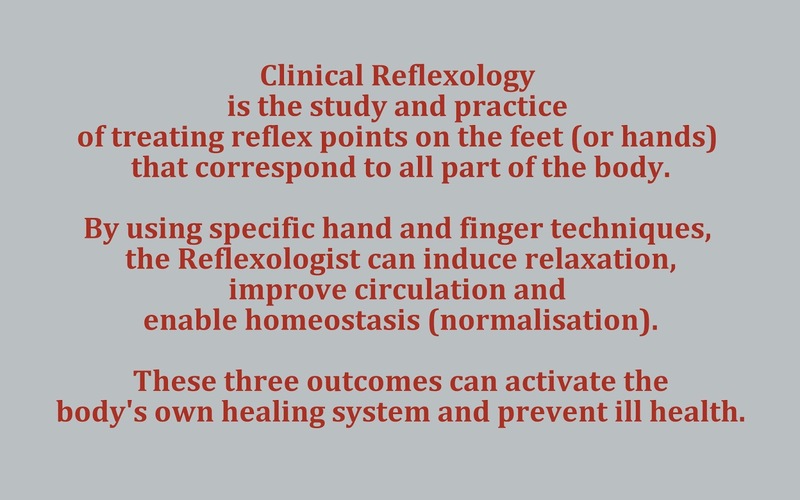 Andrea Banks Clinical Reflexology: What happens during your treatment? The clue is in the "Clinical" and you're not here for just a foot massage, though you should feel very relaxed following the treatment. The medical definition of Clinical means 'involving or relating to the direct medical treatment of patients". 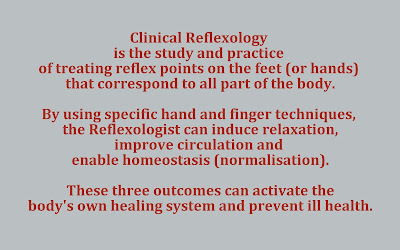 The image below gives you the definition of Clinical Reflexology. Therefore, your treatment will be very interactive as I will need to know if you have any tender areas on your feet. These tender areas relate to the corresponding part of your body and will be the areas of past and present medical conditions. I have discovered your feet will tell me a great deal about your health and wellbeing. Initially, I will follow a general treatment plan that covers the entire foot but following that, I will concentrate on specific "areas of emphasis" which generally relate to a condition or illness. Clinical Reflexology does not "cure", but it induces relexation, improves circulation and encourages your body's self-healing systems.